Duhok, Kurdistan Region of Iraq – November 18, 2018. 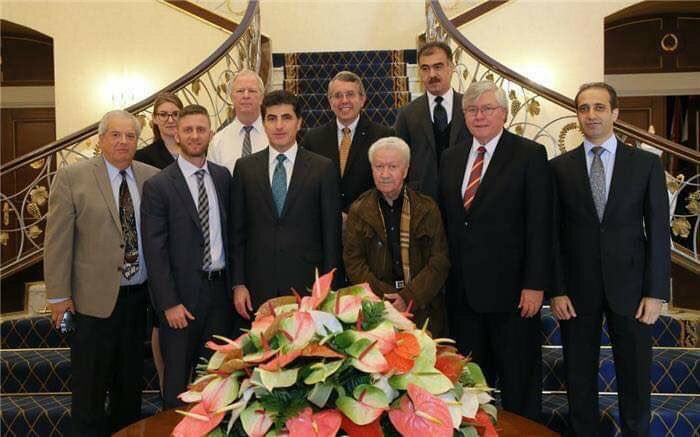 Prime Minister, Nechrivan Barzani received a delegation from The American University of Kurdistan (AUK) and The Global Surgical and Medical Support Group (GSMSG). As part of AUK’s plan to establish the school of nursing next year and responsibility toward the community, GSMSG have been officially invited by AUK, in collaboration with, Barzani Charity Foundation (BCF) and Directorate General of Health – Duhok to conduct a series of medical trainings in the city of Duhok. PM Barzani acknowledged AUK’s role in collaborating with GSMSG and showed KRG’s support and commitment to the health sector and such initiatives. For three weeks long, medical development courses for up to a hundred doctors and nurses in Kurdistan will be commenced by The Global Surgical and Medical Support Group and most of them will be hosted at AUK’s Mustafa Barzani Building.